This post was compensated by Niche Mommy Network and & Conference. We leave for Orlando in 2 weeks!! I’m so excited about taking this fun journey with my family but like any other trip I take, I have nothing prepared. My trip is planned out, but my house is in shambles & I have a ton of summer shopping to do. For me, online shopping is the way to go. I don’t have to worry about my size or favorite color not being in stock in stores. Sears.com is going to rescue me this week. 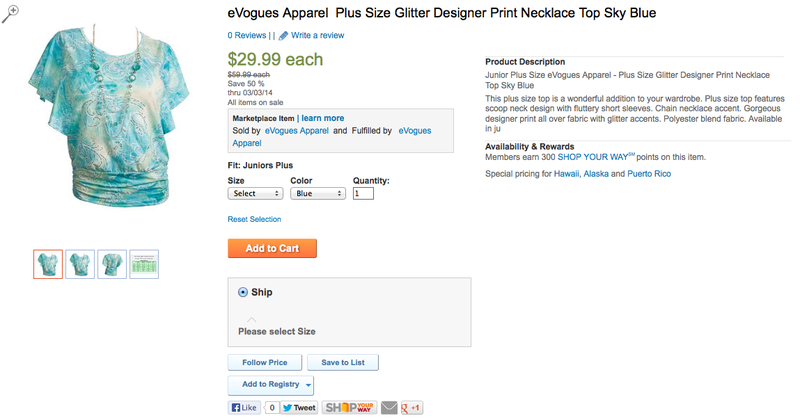 Sears has expanded its website and shopping online gives me a larger than in-stores! It’s a good thing because my local Sears is out of my way and time is always of the essence for me and my family. Sears.com carries more sizes and colors than you’d find at your local Sears! Since we are doing so much traveling this year, I found this great deal on a vehicle cargo carrier! Since I leave in 2 weeks, I can buy it online today and schedule an in store pickup when my schedule becomes I’m in the area. I love store pickup on specific items (especially larger items) since I am at work, packages just sit in front of my door until I get home. I live in a good neighborhood but that still worries me. Sears guarantees to have your item ready in 5 minutes or less, or you’ll get a $5 in store coupon. My entire family needs to freshen up our wardrobe. Being plus size, I hate trying clothes on. But, I know what style & color flatters my figure so online shopping is fine for me. Sears.com carries more sizes and colors than I would find at your local Sears! 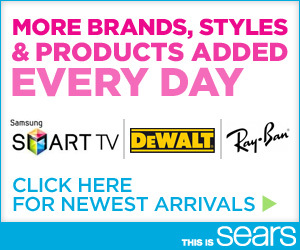 I can find brands like Ray Ban, Michael Kors, DeWalt Tools, Steve Madden, Nike, Vince Camuto, Tory Burch and more at Sears.com which makes my shopping selection even bigger than ever! I can’t seem to pry my husband away from the tools & DIY section in our local Sears store, but at least I know I can use Sears.com to get the summer travel necessities I need for my upcoming vacation. What is your #1 reason to shop online? Sears definitely has some nice stuff for a low price. We like ordering online and picking up at the store the same day. So easy and we all get what we want! SEARS has sure changed in the last while! I can’t believe how much more they offer! Good work SEARS! I love Sears. I think people don’t always think to shop their, but they have some great finds and bargains. I am glad to see Sears making a comeback. I want them to become a major retailer again. That’s a great price for that car carrier – good to know they carry them! Love Sears, always have! Funny, I’m in the market for a cargo carrier! I’m really liking the look of the Thule one. Great price. I love in-store pickup to! Recently bought my husband a smoker on sears.com. I love the variety of stuff you can find! I am loving the cargo carrier! Can stuff that thing full so easily! Sears makes me weak in the knees. I just can resist their clearance racks. I always find great things at that store. I love Sears! They have such a great policy on kids clothes, and awesome finds for me! Ok so Sears also has some really cute clothes, too! I always get in trouble if we go for something else – ha ha! I love to shop online to preview what i want to see in the stores. It narrows down my selection of what i need to look for when I go to the store. What great deals you have found. I have always been a huge fan of Sears!! Thanks for sharing and have safe travels. I love shopping online because I can browse a wider selection! I love shopping online with Sears! Looks like you found some good stuff. I love Sears. My husband just got some great dress pants from there for way less than I would’ve expected. I have never seen a cargo carrier like that either! And man, I wish I was going back to Niche Mommy this year! I may need to head over to sears before I leave next week!